What is a Writ of Error Coram Nobis? Everyone makes mistakes, even judges. If a trial court makes an error related to fact so substantial and critical that the outcome of the case would have been different, a party may seek a writ of error coram nobis. The kind of error which might result in such a writ is if the court made a mistake as to a victim’s age and imposed a conviction and judgment dependent upon that mistake (say, for example, if the court thought the victim was a minor and she was not). (3) the factual finding to which the alleged factual error is directed must not have been previously visited or passed on by the trial court. See State v. Heimermann, 205 Wis. 2d 376, 384, 556 N.W.2d 756 (Ct. App. 1996). The Wisconsin Court of Appeals has interpreted the first factor to mean that people in custody cannot seek a writ of error coram nobis because, if they are, Wis. Stat. § 974.06 provides them a remedy. Id. Additionally, the requirement that the error has not previously been visited precludes most errors because attorneys are quick to bring important errors to the court’s attention through various avenues such as objections and post-conviction motions. In Colorado, the writ of error coram nobis is perhaps even more rare. The Colorado Supreme Court once described this writ as “ancient . . . almost obsolete.” Hackett v. People, 406 P.2d 331, 158 Colo. 304 (Colo., 1965). The Hackett court explained that litigants should instead seek relief through a motion to set aside judgment. Due to the limited scope of a writ of error coram nobis, this remedy is extremely rare. In most cases, an alternative post-conviction remedy will better serve a persons needs. To speak with a knowledgeable attorney about your post-conviction options, contact the Alderman Law Firm today for your free consultation by calling 720-588-3529 (CO) or 608-620-3529 (WI). This article was authored by our managing attorney Kimberly Alderman-Penix and recently published in the Bi-Weekly Newsletter of the State Bar of Wisconsin. To read the full article including endnotes, click here. The majority of requests for review to the Wisconsin Supreme Court take the form of a petition for review, filed shortly after the final disposition of a case in the Wisconsin Court of Appeals. However, there are three additional, less used vehicles through which the supreme court may exercise jurisdiction over a case: 1) petition for bypass, 2) certification by the court of appeals, and 3) original jurisdiction. This article provides a primer on the four paths cases may take to get to the supreme court, each of which is available in limited situations. The most common way for a case to get before the supreme court is through a petition for review following a loss in the court of appeals. Petitions for review ask the supreme court to exercise its discretionary review on a particular case. “(a) A real and significant question of federal or state constitutional law is presented. (b) The petition for review demonstrates a need for the supreme court to consider establishing, implementing or changing a policy within its authority. c. The question presented is not factual in nature but rather is a question of law of the type that is likely to recur unless resolved by the supreme court. (d) The court of appeals’ decision is in conflict with controlling opinions of the United States Supreme Court or the supreme court or other court of appeals’ decisions. A petition for review must be filed within 30 days of the adverse decision in the court of appeals. This deadline cannot be extended. If the opposing party wishes to respond to the petition for review, it has 14 days (plus three days for mailing) from the date that the petition was filed to do so. The time it takes for the supreme court to issue a decision granting or denying review will vary depending on the supreme court’s schedule. In limited circumstances, a party may petition the supreme court for direct review of a matter already briefed in, but not yet decided by, the court of appeals. A matter is appropriate for bypass when it meets one or more of the criteria for review outlined in Wis. Stat. section 809.62 , as reproduced above. Additionally, the supreme court must determine that the issue is one it would have selected for review regardless of the outcome in the court of appeals. Finally, petitions for bypass may be granted when the supreme court determines that there is a need to hasten the appellate process. A petition for bypass must contain a statement of reasons for bypassing the court of appeals. It must be filed no later than 14 days following the filing of the respondent’s brief. The opposing party may file a response to the petition to bypass within 14 days after the service of the petition. The filing of the petition for bypass stays proceedings in the court of appeals, preventing that court from taking under submission the appeal. If the petition is denied, the original appeal to the court of appeals will continue as though the petition to bypass had never been filed. If the court of appeals believes that a particular case presents a question of law that belongs before the supreme court, it may certify an appeal to the supreme court. Certification means the court of appeals, instead of issuing its own ruling, asks the supreme court to take the case directly because the case presents a question of law that belongs before the highest state court. A certification by the court of appeals will be considered using the same criteria as a petition for review or bypass. Importantly, bypass will be attractive to the supreme court when there is a demonstrated need to quicken the appellate process, existing precedent on the issue is scant or conflicting, or the justices determine they will want to consider the issue, regardless of how the court of appeals ultimately rules. For the supreme court to consider an issue on certification, at least four justices must agree to hear it. Importantly, the supreme court is not a fact-finding body. Therefore, it will not take cases that involve disputes of fact. Rather, all parties to the action must agree on the facts that the court will consider. “(a) A statement of the issues presented by the controversy. (b) A statement of the facts necessary to an understanding of the issues. (c) A statement of the relief sought. To exercise original jurisdiction, at least four justices must agree to hear the case. In contrast to petitions for bypass and certifications, the criteria for granting original jurisdiction are not statutory, and are less clearly defined. If the supreme court does not deny the petition outright, it may order the respondent to file a responsive brief. The response will be due within 14 days of service of the order (rather than service of the petition). Additionally, the court may require an oral argument on the issue of taking original jurisdiction. Should the court decide to take original jurisdiction, it will establish a briefing schedule, and may or may not request oral argument on the issue to be decided. The Wisconsin Supreme Court hears very few cases regardless of which of these jurisdictional paths is pursued. The cases it does hear tend to be those that trigger its institutional responsibilities, rather than those in which justice may not have been done in a lower court. With a working knowledge of the four ways by which a case can come before this state’s highest court, an appellate attorney can quickly identify cases appropriate for high court review and more effectively advise clients on appellate options. Can I Move to Extend Time to File a Notice of Appeal After the Deadline? There are many reasons why a person may miss a deadline. Especially when proceeding ‘pro se’ (without an attorney), there are many deadlines and rules that can be difficult to keep track of. It is therefore important to know which deadlines can be extended, and which cannot. In the context of an appeal, one very important deadline is the deadline to file the pleading that informs the courts that you will be appealing an order in the trial level court. In most jurisdictions, this document is referred to as the Notice of Appeal. Each state has its own statute governing the motion to extend the deadline for filing a notice of appeal. In Wisconsin, for instance, it is Wis. Stat. § 809.82(2)(a). This statute provides that the court may extend this deadline “upon good cause shown.” Importantly, the good cause must be related to the delay in filing the Notice of Appeal, rather than the merits of the case itself. See State v. Evans, 2004 WI 84, 273 Wis.2d 192, 682 N.W.2d 784 (Wis., 2004). There is no deadline for filing a motion under this statue, however the earlier it is filed, the better chance it will be granted. In Colorado, C.A.R. 4(a) governs when a Notice of Appeal may be filed after the time to do so has expired. This statute provides that such a motion will only be granted upon a showing of “excusable neglect.” Excusable neglect exists where a litigant can show that a reasonably prudent person under the same circumstances would have missed the same deadline. If a party is successful in showing excusable neglect, the time for filing a notice of appeal will be extended by no more than 35 days. Although it is possible to ask the court to extend the deadline to file a Notice of Appeal after the deadline has passed, this is the exception, not the rule. The court has complete discretion to grant or deny such a motion, and these decisions are rarely overturned on appeal. To avoid these risks, it is best to file your Notice of Appeal on time. Can I Appeal a Restraining Order? Restraining (or civil protection) orders are temporary orders issued by judges in order to protect a particular person or entity. If you believe that a person has unnecessarily obtained a restraining order against you, you may be able to appeal (or otherwise fight) the order. Importantly, no matter how frivolous you believe a restraining order may be, make absolutely certain you abide by all its terms. Any violation, however slight, may result in arrest, fines, or even jail time. Because the chances of success on appeal are always statistically low, it may be advisable to exhaust any alternative options before pursuing an appeal. One such option is a motion for reconsideration. A motion for reconsideration asks the trial court to review and amend its findings and conclusions. This is a good option where there is newly discovered evidence, or where the trial court misapplied existing law. If a motion for reconsideration is inappropriate or unsuccessful, it may be time to file an appeal. In Wisconsin, for example, a party can file an ‘appeal by right’ asking the Wisconsin Court of Appeals to review the final decision granting the restraining order. Wis. Stat. § 808.03. Importantly, most issues must be preserved before they can be appealed. This means that, at the hearings in the trial court, a party or attorney must raise any objections to potential errors. If you plan to file an appeal of a restraining order, be sure to keep track of applicable deadlines. For example, in Colorado, the appealing party must file his notice of appeal within 14 days of the entry of the restraining ordering in a county civil court. To speak with a knowledgeable attorney about appealing a restraining order, contact the Alderman law Firm today for your free consultation by calling 720-588-3529 (CO) or 608-620-3529 (WI). A decision on the case has not yet been entered. 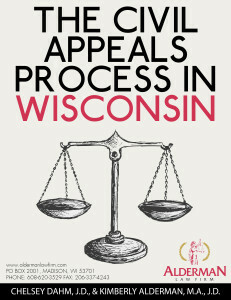 The Alderman Law Firm is pleased to announce that attorneys Kimberly Alderman and Chelsey Dahm have authored an e-book called The Civil Appeals Process in Wisconsin. This free, downloadable e-book may be used by attorneys and pro-se litigants alike while navigating the entire process of a civil appeal, from receiving an adverse decision in one of Wisconsin’s many Circuit Courts, to seeking review in the Wisconsin Supreme Court. In addition to its easy to read explanations and guides, this e-book also contains a wealth of helpful resources including checklists and sample pleadings. What is a ‘final judgment or order’ for the purposes of appeal? This article was authored by our managing attorney Kimberly Alderman and recently published in the Wisconsin Law Journal. Wisconsin statutes are clear that a final judgment or order is appealable as a matter of right, unless an exception applies. So the Court of Appeals is required to consider a losing party’s request for review of a final judgment or order. Meanwhile, a losing party may appeal a nonfinal order only if the Court of Appeals first grants him or her leave to do so. Wis. Stat. § 808.4(2). So, what is a final judgment or order for the purpose of appeal? Put another way, when does a losing party have the right to appeal, and when must he or she first seek permission to do so? A final judgment or order “disposes of the entire matter in litigation as to one or more of the parties.” Wis. Stat. § 808.03(1). A court disposes of a matter by way of explicit statements on the judgment or order that the adjudication is final. Wambolt v. Illinois Farmers Insurance Company, 2007 WI 35, 299 Wis. 2d 723, 728 N.W.2d 670. Often, circuit court judgments conclude with words akin to, “This order is final for purposes of appeal.” These words are not necessary for an order to qualify, however. In order for the court to dispose of the “entire matter,” the order must meet two requirements. Harder v. Pfitzinger, 2004 WI 102, ¶12, 274 Wis. 2d 324, 682 N.W.2d 398. First, it must resolve all the substantive issues between the parties in the case. Id. Second, the order must be the final document the court intended to issue in the case. Id. “The test of finality is not what later happened in the case but rather, whether the trial court contemplated the document to be a final judgment or order at the time it was entered. This must be established by looking at the document itself, not to subsequent events. Similarly, in Wick v. Mueller, 105 Wis. 2d 191, 313 N.W.2d 799 (1982), the state Supreme Court held that an order for a new trial was not final and, thus, could not be appealed as of right. The appellate courts do not wish to interrupt the operation of circuit court proceedings or to consider “piecemeal appeals from interlocutory orders.” Id. On the other hand, in ACLU v. Thompson, 155 Wis. 2d 442, 455 N.W.2d 268 (Ct. App. 1990), a judgment on the merits in a federal civil rights action was final for the purpose of appeal, even though the plaintiff’s § 1983 claim for attorney’s fees remained unresolved. Similarly, in Laube v. City of Owen, 209 Wis. 2d 12, 561 N.W.2d 785 (Ct. App. 1997), the court held that an order on the merits in a condemnation action was final, even though a party’s statutory request for litigation expenses was still pending. The rationale is that the trial result is “uniquely separable” from the issue as to attorneys fees and expenses. Northwest Wholesale Lumber, Inc. v. Anderson, 191 Wis.2d 278, 528 N.W.2d 502 (Wis. App., 1995). In order to be considered final, the judgment or order also must be recorded. For standard circuit court cases, recording occurs by entry of the order in the office of the clerk of courts. Wis. Stat. § 808.03(1)(a). Final judgments or orders in small claims, traffic or municipal ordinance violation cases may be recorded via corresponding docket entries. Wis. Stat. § 808.03(1)(b), (c), and (d). As a practical matter, a trial attorney should carefully review a final judgment or order for any remaining actions that may need to be taken by the court. If substitutive issues remain, the judgment or order might not be considered final upon closer inspection, even if so designated. In some instances, it may be necessary to request that the court clarify its holding in order to resolve any lingering substantive or procedural issues and thereby reduce the number of possible issues on appeal.